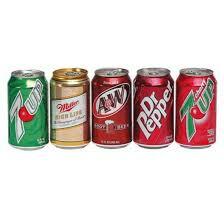 Another study links cancer to sugar sweetened beverages. A new study published in Cancer Epidemiology, Biomarkers & Prevention, has linked endometrial cancer to the consumption of sugar-sweetened beverages. The risk rate is substantial, represented by a 78 % increased risk for estrogen-dependant type I cancer, dose dependent on the amount of sugar-sweetened beverages consumed. The study group consisted of 23,039 postmenopausal women who reported dietary intake, demographic information, and medical history in 1986, prior to the cancer diagnosis, as part of the Iowa Women’s Health Study.The rate of sugar sweetened beverage consumption was evaluated by four questions asking usual intake frequency of sugar-sweetened beverages, including 1) Coke®, Pepsi®, or other colas with sugar; 2) caffeine-free Coke®, Pepsi®, or other colas with sugar; 3) other carbonated beverages with sugar (e.g., 7-Up®); and 4) Hawaiian Punch®, lemonade, or other noncarbonated fruit drinks. “Sugar-free soft drinks” included low-calorie caffeinated and caffeine-free cola (e.g., Pepsi-Free®), and other low-calorie carbonated beverages (e.g., Fresca®, Diet 7-Up®, and Diet Ginger Ale®). The scientists divided the sugar-sweetened beverage consumption patterns of these women into quintiles, ranging from no intake (the lowest quintile) to between 1.7 and 60.5 servings a week (the highest quintile). Between 1986 and 2010, 506 type I and 89 type II endometrial cancers were recorded among the women Inoue-Choi and colleagues studied. They did not find any association between type I or type II endometrial cancers and consumption of sugar-free soft drinks, sweets/baked goods, and starch. ← Breast Cancer development during puberty sparked by high fat diet.